I have many key facts regarding Bert and his life. I know about his birth, marriage, children. I even followed him through all the censuses and through many city directories. I just wanted to find his death information. It can’t be that hard…. I thoroughly searched Family Search, Ancestry, and several of my other regular genealogical sites and didn’t find anything. He just like vanished after the 1940 census. Then, I turned to one of my favorite sites, Newspapers.Com. I quickly found an article about a Bert Roberts who died in a motor vehicle accident on 1 May 1949. The article indicated that this Bert lived in Detroit. I know that at least two of his children were living in Detroit in the late 1940s so imagining that my Bert moved to Detroit during the 1940s is quite imaginable. So, could this article’s Bert Roberts the same Bert Roberts I am researching? With the name and date of death, it should be easy to confirm that this is the right Bert Roberts and I will have the answer. After searching for hours… and hours… and hours… I just couldn’t find anything. Sure, I found other articles about the accident but nothing that mentions next of kin. One article said that the body was shipped back to Detroit (NewspaperArchives accessed via MyHeritage). I thought I should find a death certificate in Indiana records – No such luck. Maybe an obituary in Detroit/Michigan records – Again no luck. I searched this way, that way, and the other way but no success. I found it incredulous that I couldn’t find a link as to who this Bert Roberts, who died in Elwood, IN, was. I kept searching. I got more and more compulsive about finding if this Bert was my Bert. After spending the better part of three days (probably over 20 hours searching), I have finally come to the conclusion that this is not time spent well. I have other fish to fry and need to move on. Will I return to searching for my Bert’s death information? Of course, but I will also hope that my research into other individuals in this family will prove (or disprove) my Bert and this Bert are the same person. Bert Allen Roberts was probably born on 20 September 1903 in Sessor, Franklin County, Illinois[i]. I say “probably” because, although his marriage records indicate his birth as 20 September 1902, every census indicates him to be born consistent with a birth in September 1903 (age 6 in 1910 Census, age 16 in 1920 Census, etc.). It is not clear why he would make himself 19 instead of 18 when he married, but it appears that he did. I believe him to be the third of four children born to Hugh Ellis and Clora D (Scott) Roberts. His older siblings were Harry Ray and Carrie Mae. His younger sibling was Mable Ilean. Family of Hosea Adams with Roberts children. In 1920, his is still living with his mother and step-father, in Hutsonville, Crawford County, Illinois, but now working as a farm laborer for wages[iii]. The 1931 Terre Haute Directory is something of a conundrum. It shows Essie P Roberts (wid Bert A) working as a cook[vii]. I think this is in error for a number of reasons as follow. The 1940 Census has the Roberts family living at 1719 Chestnut Street, Terre Haute, with Bert working as a laborer in the enameling and stamping industry[x]. That is the last solid entry that I have for him. We know that his youngest son, John Harald Roberts married Isabell Jean Matcher in May of 1947 and lived in Detroit. [xi] We also know that his son, Hugh Eugene married Janet Marie Dion in Detroit in 1950. [xii] With at least two of his children living in Detroit in 1949, it is easy to imagine that Bert was also living in Detroit. If so, the vehicle accident on 1 May 1949 could have easily been his death. I know that I was being compulsive placing so much time trying to connect the 1949 death of a Bert Roberts to my Bert Roberts. 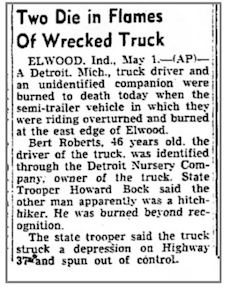 I thought, my goodness, I should be able to find something about the death of Bert Roberts of Detroit who died in Elwood, Indiana on 1 May 1949. I will put it aside for now and come back to it after I’ve researched more of the family. 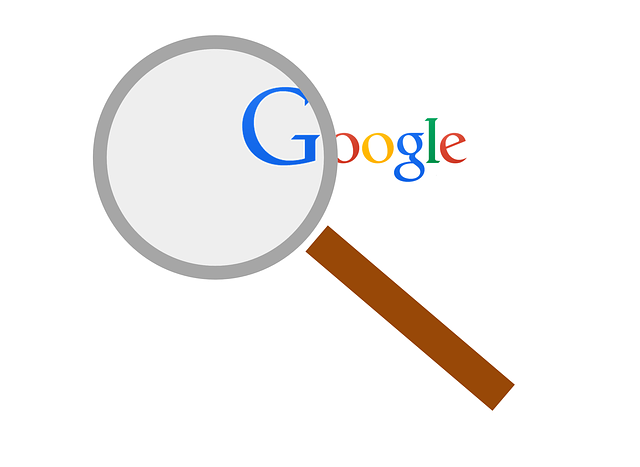 Hopefully, my overall genealogical research process will intercept the information I am looking for later and everything will fall into place. [i] “Indiana Marriages, 1811-2007,” Sullivan Co., Indiana, Bert Allen Roberts, 1922, GS Film Number 001906822-Digital Folder Number 004170594-Image Number 00614, Image, Family Search, https://familysearch.org/ark:/61903/1:1:XXF1-HZN, 27 Dec 2015. [ii] “1910 Census,” Turman, Sullivan, Indiana, Hosea L Adams, Roll: T624_381; Page: 6B; Enumeration District: 0178; FHL microfilm: 1374394, Ancestry, 22 Dec 2015. [iii] “1920 Census,” Hutsonville, Crawford, Illinois;, Hosey L Adams, Roll: T625_364; Page: 4B; Enumeration District: 29; Image: 66, Ancestry.Com, 22 Dec 2015. [iv] “Indiana Marriages, 1811-2007,” Sullivan Co., Indiana, Bert Allen Roberts, 1922, GS Film Number 001906822-Digital Folder Number 004170594-Image Number 00614, Image, Family Search, https://familysearch.org/ark:/61903/1:1:XXF1-HZN, 27 Dec 2015. [v] “U.S. City Directories, 1822-1995,” 1929, Terre Haute, Indiana, 411, Bert A Roberts, R. L. Polk & Co., Ancestry, 22 Dec 2015. [vi] “1930 Census,” Terre Haute, Vigo, Indiana, Bert A Roberts – Head, Roll: 635; Page: 9B; Enumeration District: 0022; Image: 637.0; FHL microfilm: 2340370, Ancestry, 21 Dec 2015. [vii] “U.S. City Directories, 1822-1995,” 1931, Terre Haute, Indiana, 387, Roberts, Essie P, R. L. Polk & Co., Ancestry, 21 Dec 2015. [viii] “U.S. City Directories, 1822-1995,” 1934, Terre Haute, Indiana, 323, Bert A Roberts, R. L. Polk & Co., Ancestry, 21 Dec 2015. [ix] “U.S. City Directories, 1822-1995,” 1936, Terre Haute, Indiana, 350, Bert A Roberts, R. L. Polk & Co., Ancestry, 22 Dec 2015. [x] “1940 Census,” Terre Haute, Vigo, Indiana, USA, Bert Roberts – Head, Roll: T627_1103; Page: 13A; Enumeration District: 84-31, Ancestry.Com, 21 Dec 2015. [xi] “Michigan, Marriage Records, 1867-1952,” John Harald Roberts, County File Number: 704264-State File Number: 381870, Michigan, Marriage Records, 1867–1952. Michigan Department of Community Health, Division for Vital Records and Health Statistics.-, Ancestry, 21 Dec 2015. [xii] “Michigan, Marriage Records, 1867-1952,” Hugh Gueene Roberts [Eugene], County File Number: 780165 – State File Number: 461232, Michigan, Marriage Records, 1867–1952. Michigan Department of Community Health, Division for Vital Records and Health Statistics.-, Ancestry, 21 Dec 2015.